That's the ingredients for my current project. A few years ago, the Manchester branch of the Embroiderers Guild made yellow squares as part of a rainbow squares project for a regional meeting. Now we've decided to do the rest of the rainbow. 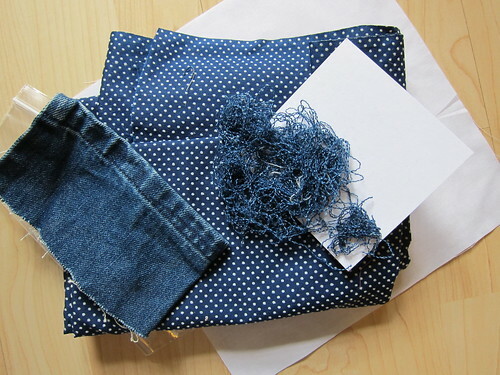 I signed up to make an indigo square. My basic idea is to couch swirls of threads taken from some old denim. In my imagination it looks a bit like Van Gogh's Starry Night. I suspect that the reality will be a bit less impressive, but I'm curious to see what it ends up like. Not so curious that I'm working really hard at it, though. I pulled the ingredients together on Sunday night, but it was only today that the stitching got started.